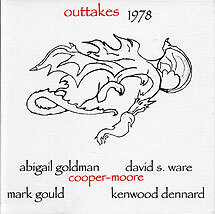 Cooper-Moore, diddley-bow, piano, clay fife, slap pipe, ashimba, twanger, voice; Mark Gould, trumpet; David S. Ware, tenor saxophone; Kenwood Dennard, percussion; Abigail Goldman, voice. Recorded on 27 June 2000 at Estudi 84, Barcelona. Front cover art (reproduced above) by James Beall.